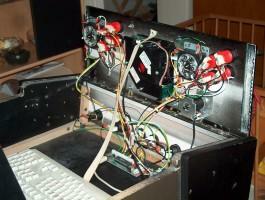 This page describes my conversion of an Atari Klax arcade cabinet to a home gaming machine. For those who grew up in Germany, or in another part of the world where such pleasures are considered a danger to the youth and thus restricted by law to those above 18, arcade games - coin-operated computer games from the early 1980s - are rather an unfamiliar thing. Those who were lucky enough to spend their holidays in places where arcade machines were available in public places, however, will remember all those simple yet highly entertaining games that ran on dedicated hardware, with graphics that were nothing but primitive by today's standards but revolutionary for their time, and with ingenious and brilliant gameplay to compensate the hardware's shortcomings. Today, arcades are gone and so are the old games. They only live on in the basements of arcade machine collectors, and in emulation programs that allow yesterday's hardware to be reproduced in software on today's personal computers. In order to get a bit of the fascination of my childhood days back into my living room, I built the nice piece of furniture shown to the left, the construction of which is described on this page. Any feedback is welcome. The cabinet was acquired in July 2004, and the conversion was completed in October. The total cost was somewhere between 500 and 1000 EUR (not counting the PC and monitor), didn't work it out exactly (didn't really WANT to). In 2003 I built a wooden box with an I-PAC and some arcade controls on it, which one year later became the ancestor of the Klax conversion. The box used two Ultimarc J-Stick joysticks, 4-8-switchable from the underside, and four buttons per player. I re-used the controls for the Klax in order to keep cost down; the box is now gutted and out of use. The box didn't have coin, pause, and quit buttons; I used the I-PAC's shift feature instead. The curved alignment of the buttons was very comfortable to use (however I should have put the buttons closer to each other), but couldn't be implemented on the Klax due to size restrictions. 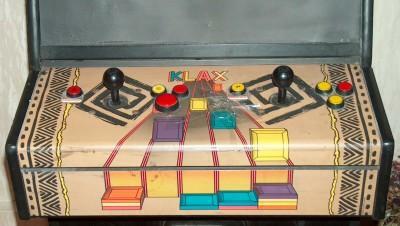 The box was 60 x 20 cm inside, nearly identical to the Klax' control panel. The cabinet itself is an original Atari Klax arcade cabinet built in 1995. Someone had obviously modified it into some different game since it had a number of buttons that definitely had nothing to do with the Klax game. Never mind, I made good use of some of these. When I bought the cabinet it was gutted - no electronics, a broken monitor, and a marquee light that came apart upon touch - and smelled like, well, nothing you'd like to have in your livingroom (probably having been in an ill-ventilated pub for 10 years or so). I put several plates with coffee powder into it for a couple of days in order to de-odorize it. I then removed all that was inside and scrapped most of it, apart from a couple of buttons (we'll later see what happened to them) and the marquee. This picture shows what the control panel looked like when I got the cabinet. It's a metal panel with the original Klax artwork on it, with two heavy-duty joysticks and three buttons plus a start button for each of the two players. These left a lot of holes in the metal panel which, unfortunately, made it unusable for me and required an all-new panel to be built. The new panel was built by my brother-in-law who's a joiner; he did a terrific job. Since the cabinet was designed to be put up in the living room, and since it had no colourful artwork apart from the marquee (once the original control panel was gone), I decided for the control panel to be plain black. This also fit nicely with the red controllers I wanted to re-use from my original box. One joystick per player, 4-8-way switchable. Four buttons per player, located to the left of the joystick. That's not what you find on the original arcade machines, but I started playing computer games on an Atari VCS which had the joystick button on the left, and that habit kind of stuck. A large trackball and a spinner. A start button and a coin button per player. A "pause" and a "quit" button. 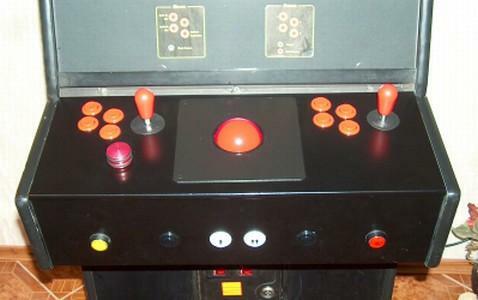 The coin buttons should be black and thus kind of hidden - original cabinets don't have any. The pause and quit buttons should be far apart from each other in order to prevent accidental termination of games. These meta buttons, together with the start buttons, should not disturb the actual game controls, so I put them on the front of the panel. Having decided on the control panel layout, I printed a 1:1 scale copy of the panel and glued it to cardboard. This allowed for some early usability testing (e. g. to make sure that the spinner didn't get in the way when using the joystick) and provided a handy drilling template for the final wood panel. The picture below (right) shows the cardboard template with the spinner, trackball, and one button in place. The panel can be opened in order to provide access to the joysticks' 4/8 way switches, and for easy maintanence of the controllers. This turned out really handy during assembly because it allowed the controllers to be put into the panel and wired after the panel itself was completed. When I bought a new home computer in June 2004, the one I had previously was dedicated for use in the Klax cabinet. It's a 600 MHz Pentium that was bought in 2000, with 20 GB harddisk, built-in graphics and sound, two USB ports, a CDROM drive and a CD burner. 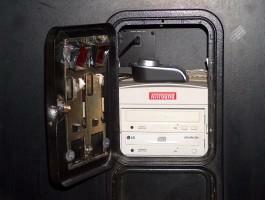 The PC fit nicely into the bottom of the cabinet, with the CD drives being accessable through the coin door. I removed the coin mechanics and coin boxes in order to provide space for the PC. The digital controllers (joysticks and buttons) are connected via an I-PAC which makes connecting arcade controllers to a PC a total no-brainer. The I-PAC occupies one USB port and the spinner occupies the other (operating as a one-axis mouse). The trackball is connected to the PS2 mouse port; I originally wanted to connect it to USB as well using a cheap hub, but that turned out to be unstable (probably due to operating system issues). The trackball is the PC's mouse; the mouse buttons are on the underside of the control panel drawer, accessible from the left of the panel if you know where to look and invisible if you don't (used two of the original buttons that came with the cabinet). None of the controllers requires any special driver software, and they work with any operating system. The PS2 keyboard connector is occupied by an ordinary PC keyboard which I placed inside the control panel drawer for maintenance. The monitor is a 21" HP CRT monitor which fits nicely into a shelf we built into the cabinet. The picture to the left shows the back side of the cabinet - it's always operated with the back panel open to provide for ventilation - with the monitor on its shelf. The monitor is about the same size as the original one, but it sits quite a bit higher, so I had to cut a new bezel from black cardboard to put behind the front glass. The picture also shows the PC's power switch, which is the red spot above the yellow label on top of the cabinet. This is another of the original buttons I re-used, placed in the hole where the original power switch was and wired to the PC's mainboard. Pressing this switch starts up and shuts down the PC, and putting it into this particular place also makes it a nice child lock (at least for younger children with lesser climbing skills). The big advantage of this is that, together with custom startup/shutdown images, it makes Windows completely invisible. There is no Windows logo at startup, none at shutdown, and no Explorer or Windows desktop of any kind ever. Also, it makes it impossible for users of the cabinet to mess with the PC's internals. How would you delete files when there's no desktop or Explorer? The big disadvantage is, of course, that Windows is inaccessible even when you need it, i. e. to install new software or tweak some graphics settings. So, don't modify system.ini as described above unless you have some kind of back door that allows you to restore the original version! I use Knoppix which is a version of Linux that boots from CD. Insert CD, boot, mount the Windows partition, restore (or edit) system.ini, remove CD, reboot, and you're back in your Windows desktop. Knoppix also contains a nice backup program called "partimage" which I used to create an image backup of the Windows partition. In case of disaster, I can simply boot Knoppix again and restore everything from the image. The machine starts up in 40 seconds and shuts down in a glimpse. The cabinet was bought via Ebay from alpha electronics, Worms, Germany. It was in an excellent shape and was shipped to my place, professionally wrapped. No complains. I got the joysticks and buttons and, of course, the I-PAC from Ultimarc, London, UK. Not cheap but definitely worth the money. The buttons are inferiour to the Happ ones, however, at least in my opinion. Shipping was slow - it took over two weeks because the dummies at the German branch of the shipping company were too dumb to turn around the parcel and find my address. Nothing to blame on Ultimarc, of course, and they have since moved to a different (and cheaper) shipping company. The Tornado Spinner was supplied by SlikStik, Nutley, USA. Ultra-fast delivery, I received the spinner three days after paying via Paypal! The spinner is a superb piece of hardware, albeit quite costly, and shipping was the fastest and cheapest of all. Best of all, it came wrapped in a near complete issue of a New York newspaper which made for some very interesting reading. The trackball and coin buttons came from Happ Controls, Elk Grove, USA, respectively their branch in the UK. Placing an online order is easy but actually getting your items is not. It took several weeks and several e-mails to finally receive my items. The trackball was expensive and shipping was VERY expensive. Compare the price of a Happ trackball plus USB interface to that of an equally-sized Ultimarc trackball plus MiniPAC! The only reason I ordered from Happ is that Ultimarc didn't have a 3" high trackball by that time. The quality of the Happ controls is superb, however; the Happ buttons feel much better than the Ultimarc ones to me, and the trackball is excellent (it does have some backspin issues in certain games however). Visio file (.vsd) with the control panel layout. Also contains the instruction card. The instruction card I put above the control panel. 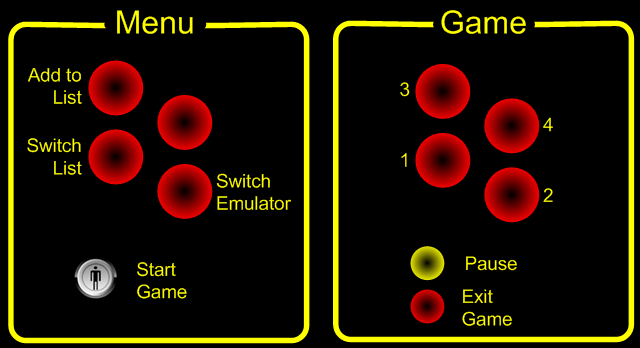 Explains button use in frontend and game. May be modified to explain the buttons for a particular game. Scans of the handwritten schematics for my original controller box. Running a homepage with external links is a dangerous business in Germany. You link to some program that some time later becomes illegal for whatever reason, and suddenly you receive a letter from some lawyer informing you that your homepage is breaking the law, that you please remove the offending link, and pay the laywer's bill in the range of several thousand euros.  For that reason, this site has no external links even although many would be adequate - links to MAME, the I-PAC, the Build Your Own Arcade Cabinet sites and many more. If your are interested in further information on these topics, please consult Google or a similar search facility. Sorry for the inconvenience. Thanks to my brother-in-law who built the new control panel and did all the other woodwork. Without his help, I would not have been able to finish this project, let alone do such a good job. Thanks to my brother for the initial idea of convering an existing cabinet (instead of building a new one from scratch), and for helping me getting this 100 kg beast up to the third floor. Thanks to my coworker who helped me do the wiring of the digital controllers to the I-PAC. Thanks to my wife for her patience, love, and for constantly kicking me out of the high score tables. Thanks to all the retrogaming people on the Internet who provided me with lots of information through their web sites and Usenet articles. I hope that this site returns to the retrograming community a little bit of what I got from it.